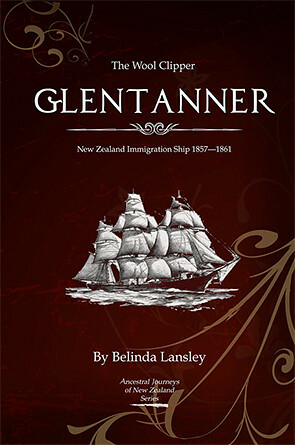 The ship Glentanner is the subject of my new book called "The Wool Clipper Glentanner: New Zealand Immigration Ship 1857-1861"
It is now available on Trade Me for New Zealanders (the cheapest way to buy it), or for anyone outside of New Zealand, it is on Amazon. Please be very quick on Trade Me as I have only two books left to sell! “My God, we are lost!” cried the Captain. The Glentanner survived a horrific ordeal to go on to deliver two loads of immigrants to Lyttelton, New Zealand as well as taking wool back to the United Kingdom. Using official records, as well as the dramatic account of one of the passengers, this book tells the amazing survival story of the clipper ship Glentanner. It includes passenger lists and passenger biographies for the two Lyttelton journeys, with a brief account of the ship’s journeys to Australia in the 1840s and 1850s. As noted above I have only gone into brief details about journeys to Australia and have concentrated on the 1857 journey to New Zealand. So far I have managed to do research on nearly every family or single person on board the 1857 journey, apart from a few people with common names and cabin passengers who don't have many details about them. So if you think your ancestor was on board, then hopefully I will have at least one interesting fact about them in this book. This absolutely beautiful cover was designed by strawberrymouse designs! Thanks so much! Check if your ancestor is on the passenger list below and if they are buy my book! This helps me to write and publish more immigrant ship books to help others learn about their ancestral ships. I found an account of the 1857 voyage which is not widely published on the internet and took hours to find!!! It is fascinating and is in my book.